The inductees for the NASCAR Hall of Fame for 2017 have been announced. The 2017 class includes Rick Hendrick, Richard Childress, Raymond Parks, Mark Martin and Benny Parsons. Martinsville Speedway founder H. Clay Earles won the 2017 Landmark Award for outstanding contributions to NASCAR. Benny Parsons, who died in 2007 of lung cancer at age 65, became one of the most beloved figures in the NASCAR community. Parsons is recognized as one of NASCAR’s top 50 drivers. He won 21 times in 536 starts but finished in the top 10 in more than half of his starts. He was also the first driver to eclipse 200 mph in 1992 at Talladega Superspeedway. Mark Martin got into NASCAR when he was just a teenage dirt track driver growing up in Arkansas. He went on to win 96 races across NASCAR’s national series competition, including 40 on the Sprint Cup level. 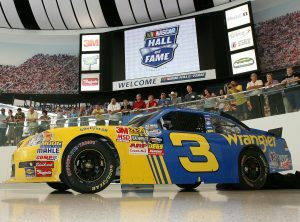 However, he never won a championship, finishing second in the Sprint Cup standings five times. Car owner Rick Hendrick, the founder and owner of Hendrick Motorsports, has won 14 owner championships. Eleven of those wins were on the Sprint Cup circuit, including six with Jimmie Johnson, four with Jeff Gordon and one with Terry Labonte. Raymond Parks was one of stock car racing’s earliest team owners and was the first car owner to win a title. His cars went on to dominate in the 1940s, winning the first modified NASCAR title in 1948 and a premier series title in 1949. He died in 2010 at 96. Richard Childress won 11 owner championships across NASCAR’s three series. Childress purchased his first racecar at the age of 17 for $20. He loved racing so much that he formed Richard Childress Racing in 1972. He continued racing until 1981 before transitioning to being a full-time owner. Childress’ cars helped Dale Earnhardt win six championships and 67 races between 1984 and 2000.